USE THIS AREA AT YOUR OWN RISK. BUYER BEWARE AND ALL THAT. BY USING THIS AREA, YOU AGREE THAT DOUG REEVES CANNOT BE HELD LIABLE FOR DEALS BETWEEN PEOPLE THAT GO SOUTH. Do not post eBay listings. We don't do the bidding war thing here. Don't list barnstormers ads, or any other links to competing sites (bad form). 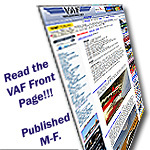 Everything you need to know about posting/viewing/searching in the VAF Classifeds can be found at http://www.vansairforce.net/VAFclassifieds.htm. Make sure you follow the rules. Last edited by DeltaRomeo : 07-26-2016 at 01:43 PM.